The hostility is STRONG with these ones. Thankfully, a heroic old dude by the name of, Richard Schwartz, called out the rude Seattle City Council members. Job well done, sir. The city of Seattle experienced its most "monstrous" snowstorm since 2017, last week, and people kind of lost their heads. Grocery stores were a mess of timid, nervous excitement, gathered in long passive aggressive lines at the self-checkout as people cleared the shelves and stocked up for what someone outside the city might think, was the next game-ending Ice Age. This man's inspired take on what that looked like as it befell the city is hilariously on point, and pulls zero punches in the process, for what makes the whole sh*tshow just so lovably ridiculous. Nobody knows anything about your hometown and it is pointless to even try. Get your Irish pride on in these cities. Seattle Sports Are Going on a Road Trip! This was seen at a failing Wet Seal in Seattle. 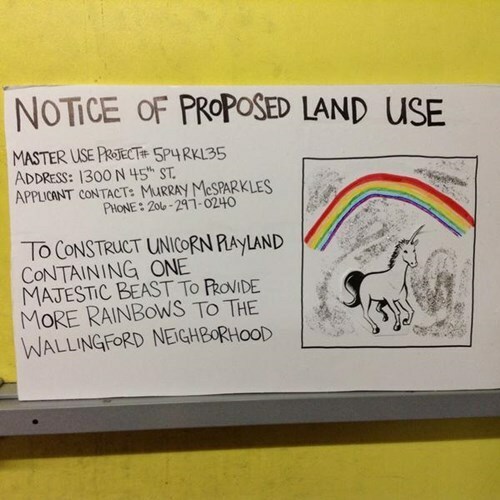 That's novelty goods seller Archie McPhee (of horse head fame) seeing if the city of Seattle will clear them to own a Unicorn and keep it on their property. Luckily, Ed Murray is down for it. Yep, that's the official poster for the least-anticipated film of Basically Every Dude Everywhere. Boyfriends, prepare yourselves now.